BirchBox is a monthly beauty subscription that sends you beauty and lifestyle items that may be sample size, deluxe sample size, or even full size! With last month’s box being my first, I received both May and June around the same time. While excited, now I know I’ll have the real month long wait between boxes-kind of depressing considering how much fun that was! Sorry about the fuzzy pic, didn’t realize my lens managed to get a bit dirty. This month’s these is “Away We Go” and the samples provided are designed to have you travel ready (which somehow includes stay-cations). They also included a travel quiz, which you can take to enter for a chance to win your own getaway. There were only a few questions, and I managed to pick a pretty well rounded bit, only barely picking New York, New York in the end. Number 4 Hair hydrating shampoo and a bonus conditioner – This stuff smelled amazing! And I loved the way my hair felt, though there was almost a bit of a filmy feeling afterwards–Like I couldn’t quite rinse the conditioner fully. COOLA Tinted Matte SPF 30 for Face – I haven’t had a chance to try this one yet, but I’m always interested in a good face sunscreen. The tint is a nice bonus if it ends up looking good. Gilchrest & Soames London Collection Body Lotion – Was not a fan. It smelled alright, and I’ll definitely use the rest, but it was super runny for a body lotion. I like something with a bit more substance to it. Vasanti Cosmetics BrightenUp! Enzymatic Face Renovator – This is probably my favorite item in this month’s box. I love a good face scrub, and this stuff felt awesome. It had superfine minerals that felt really amazing, and I loved the way my face felt afterwards. Joie Folle de Joie Eau de Parfum – Perfumes are never my favorite in a box. I think it’s mainly because I hardly wear them during the week (I’ve always felt it’s poor etiquette to wear perfume in an office). This one was OK. It’s a bit sweet and flowery, and light, so for me it would be nice during the day. So that’s the goods in my box. I’d love to have gotten some makeup to try, but I’m still happy with everything I got to try! The only major disappointment is that I’ve gotten two perfumes in a row, despite my profile. We’ll see what next month brings, or Ipsy’s box, then I’ll try fiddling with my profile. 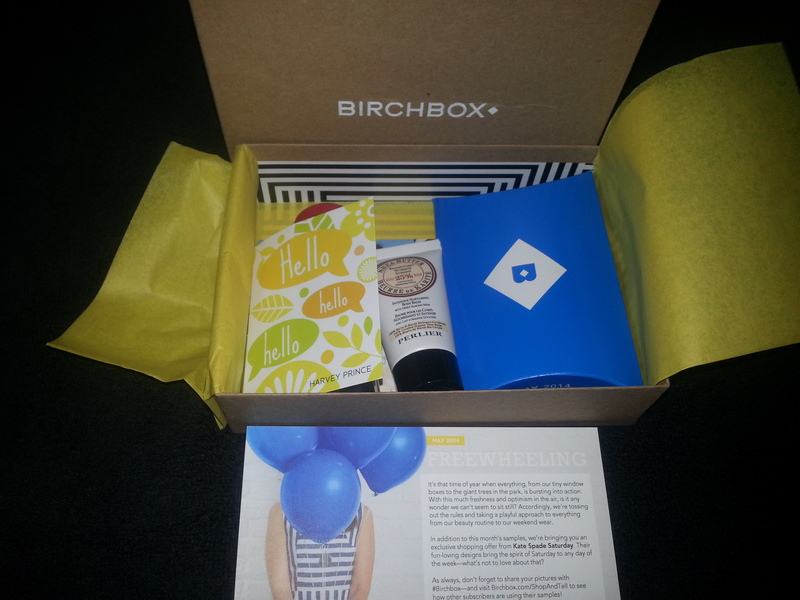 What did you think of the June 2014 Birchbox? Currently, you can sign up for a 12 month sub for $99 using the code BBSUBYEAR (hurry, ends June 9!). See my latest WIGW post for some additional goodies you can snag with this deal, though they should still be good after this coupon expires. I first want to say the box is absolutely adorable. I cleaned out a tuperware-like set of drawers I had, and used this for spacers within the drawers. I think it’ll look cute when they are all filled up! Inside the box, wrapped nicely in tissue paper was 5 samples for me try, a sampling insert detailing my haul, a sunscreen tips card, and a coupon for the Kate Spade Saturday store. Supergoop! – Lightweight sunscreen with SPF 30. This is the one I haven’t tried yet, but it’s in the weekend plans (or if it’ll stop raining and I can spend some time out side to really test it! Seriously, every time I get a sunscreen sample, it rains). Cynthia Rowley Black Eyeliner – This one came in a few colors, and I’d say I hit the jackpot getting black… Though, the point was to step out of my comfort zone? Nah, I’m happy! Great eyeliner, very smooth and looks amazing. Beauty Protector Protect and Detangler – Unfortunately the pump didn’t work, but I still managed to try this stuff out. It smells amazing and I love the way my hair feels! Perlier Body Cream – I got Shea Almond, and wow does this one smell amazing! I normally dislike anything almond scented, but this one did it right. It’s a great consistency, and super moisturizing. Harvey Prince Hello – Probably my least favorite item, but even that’s not saying much. The scent was great, and seems like a good summer evening scent for me. Not something I’d rush out to buy, I’m super picky when it comes to my perfume (that, and I’d make the boy buy it for me at this point! ), but I’ll take advantage of the sample! Now, I want to take a second to break BirchBox down for anyone on the fence like I was because it’s mostly samples. You get 10 points when you sub for spending $10 (assuming you only go month to month). Every box comes with, say, an average of 5 items, which award you 10 points each every time you review them. 10 points = $1 in the BB store. So that’s $5 back on average, meaning you pay less than $5 per box! I’d really suggest going the 1 year sub for the best deal, since you get 1 point per dollar spent on the ENTIRE sub–whether it’s $110 or $99 with the coupon, it’s like getting another $9.90 to $11 off your total! To break mine down- At $99 per year, I got 99 points, so I’m down to $89.10 for the year. This box will score me another 50 points, meaning this box of samples cost me a whopping $2.43. I’d say that’s worth it for the fun surprise every month! And that’s not including the goodies I’m getting with another mystery sample box! Sign up today! What are you going to save your Birchbox points for? 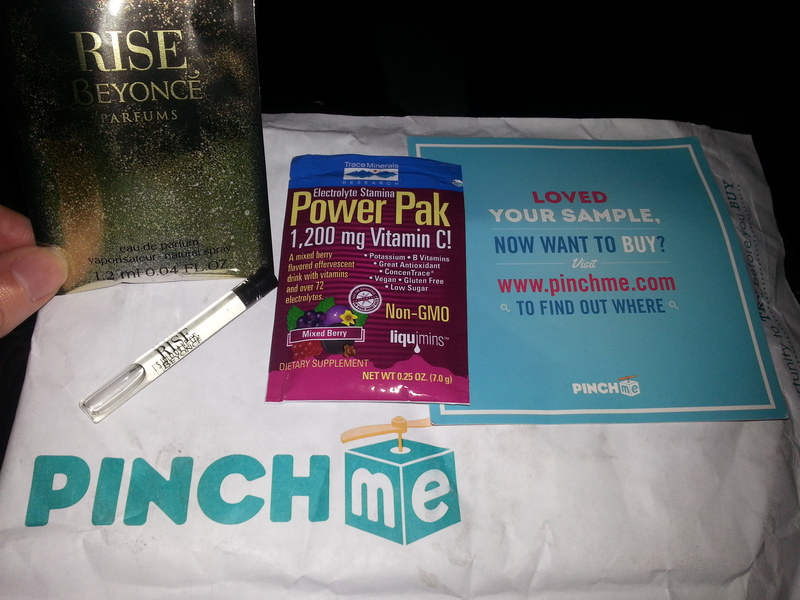 May Birchbox (review coming soon! ): I was so pleased with how quick they sent my first box to me, and the fact there was an awesome sale on the year sub, I went ahead and upgraded my account. I used the Coupon Code BBSUBYEAR to get a 1 year sub for $99 (regular is $110), so that’s two free boxes per year. Even better? They have a deal going on where you get a free mystery sample box with purchases $35 and up. ALSO, and I missed this one, I believe you can score a Shasi Sam Bracelet by using the Coupon Code SHASHIGIFT with this as well. Either way, snag that year sub deal, it ends June 9! May Bonjour Jolie box (yep, I owe another review): All I can say right now is that I’m super pleased with this box and glad I picked it up. VIP Products toy tester toy of the month: Normally the mail comes while I’m at work, and Riley gets to open his mail when I get home. The jerk decided instead that he’d pull the package down from the counter and tear right into it. He loves getting mail, and he loves opening mail. But I’m still impressed, since he left my boxes alone the day before, and they were MUCH more at his level on the edge of the table rather than shoved all the way to the back of the counter. Anyway, he couple of new oversized tennis balls that squeak, and he couldn’t be happier. He had me, the neighbor, and the neighbor’s son throwing it for him. I actually had to hide it to get him to come inside. Crowdtap finished their drawings for the month of may, and I ended up with 10 Amazon gift cards ($5 each) and 1 Walmart gift card ($25). Traded Walmart for Amazon, and my Kindle/tablet savings continues! Good haul this month, and definitely worth the extra effort. I also got an invite to a sample and share for a Schick Hydro 5 Groomer for Michael. I WON! I’ve discovered the world of blogs, and with that, sweepstakes. At least ones that I’d be remotely interested in winning. But I got an email that I won three organic chapsticks. Will post when/if I get them! Not bad for one week! Did you get anything good? ?